"Everything about our physical setting exudes our brand," says director of marketing. At the new Shake Shack in Dubai, you can get the standard Shack Burger, crinkle-cut fries and a chocolate shake so thick it will make you forget you're in the desert. Not on the menu? Traditional advertising. New York-based Shake Shack, with its cult East Coast following, has snagged lots of attention for its savvy use of social media instead of the typical fast food ads. What’s less understood is how the chain uses the restaurants themselves to present its branding story. Outlets are sharply designed as a modernist take on the company’s original New York City hot dog stand and are carefully orchestrated to generate maximum buzz, which then ripples out via social channels such asInstagram, Tumblr, Periscope and SnapChat. Each eatery, in essence, serves as a stage for consumer-generated marketing content. 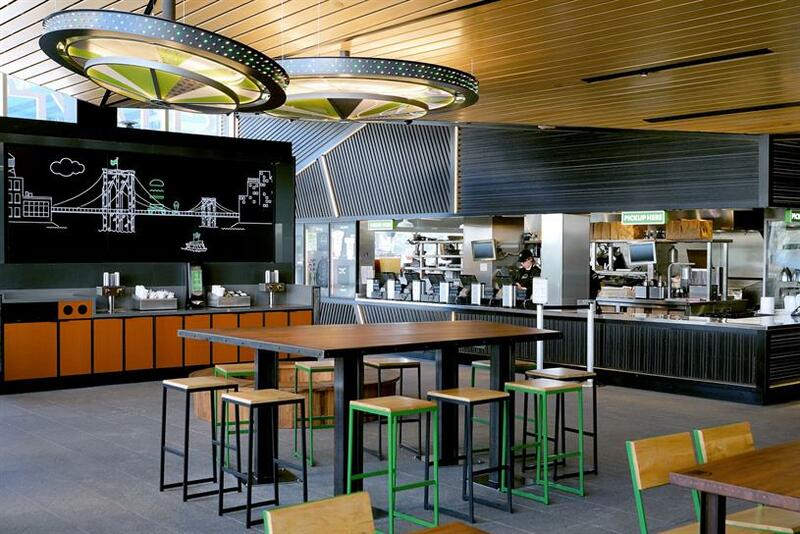 "Everything about our physical settings exudes our brand," said Edwin Bragg, Shake Shack director of marketing and communications. "We tell stories about our local food purveyors on our menus, specials boards and the digital signs hanging on the wall," he said. "Your table at a Shack is probably made from wood recycled from old bowling alley lanes — and it says so right on the top of it." It seems to work. After the company’s IPO in January, first quarter sales at the 63 outlets around the world were up 11.7%. Contrast than to McDonald’s with saw same stores sales in the U.S. slump 2.3% in the same period. Of course, changing tastes in "fast food" aren’t helping. As Americans focus more on the quality and healthfulness of their foods, old-line competitors like McDonald’s and Burger King are losing ground to the Chipotles and Shake Shacks of the world. Indeed, with its focus on fresh, premium ingredients, Shake Shack says it aims for customers who place a premium on quality food and are picky about their fast-food dining ambiance. Translation: Millennials. For example, when it comes to music, employees are invited to hand-pick the music played in each store, "to create a lively vibe," Bragg said. And those playlists are then deployed as their own marketing asset. "People can download our monthly Spotify playlist, called the SHACK10," he said. Even the buzzers that tell customers when their order is ready have a marketing role to play. "We use the buzzers as a canvas to promote our ingredients or simply say something fun, like, ‘The moment of truth.’ " Bragg said. As they wait for their lunch, hungry, mobile-savvy customers frequently share pictures of their buzzers on social media. The brand tries to tap into fans’ interests beyond food, too. At some U.S. branches, for example, customers are invited to join Shack Track & Field running clubs to help burn off their 740-calorie chocolate shakes. All of this is intended to build a sense of sharing and belonging among customers who are eating and waiting to be served. "The idea of community informs all our marketing," Bragg said, "We try to give our guests reasons to stay longer and enjoy the experience." Experts say the Shack has a knack for making the on-site experience the core of its marketing. "The stores create a non-chain feeling and storytelling elements are scattered throughout the décor," said Randy Lopez, senior marketing executive with Synergy, a restaurant consultancy. "The food is openly prepared in a way to encourage customers to take pictures and share. In-store marketing rallies fans to actively participate." Such transparency is particularly seductive to consumers who care about the food they’re eating. "People increasingly want to have a clear understanding of what companies are using in their products," said Dena Brody, global account director of Sparks & Honey marketing agency. Consumers will reward restaurant chains that are mindful of that, she noted. Restaurant consultant Aaron Allen said that the Shack’s in-store approach also taps consumers’ "feeling that where they eat communicates something about their individualism and their values." Brands like Shake Shack show that the era of fast-food "mass standardization is over. We have now entered the era of mass customization." Beyond the East Coast, Europe and the Middle East, Shake Shack operates in Las Vegas and plans to enter the Los Angeles market next year.